Professor, University of Stavanger, 1998-current. 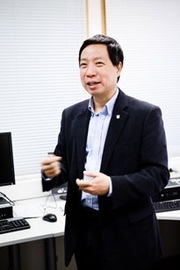 Visiting Chair Professor, Tsinghua University, 2011-2013. Visiting Professor, Stanford University, 2009-2010. Chair of the Steering Board, Cloud Computing Association (CloudCom), 2008-current. Research Coordinator for China, POSC Caesar Association, 2008-current. member of the board, Norwegian Information Security Network (NISNet), 2007-current. Guest Professor, Sun-Yat Sen University, 2009-current. Guest Professor, Beijing Jiaotong University, 2008-current. Adjunct Professor, UniK/University of Oslo, 2005-2009. Chairman of the Board, Assocaition of the Norwegian Informatics Conference (NIK), 2005-2007. PostDoc, Simula Research Laboratory, 2001-2003. Visiting Scholar, University of Southern California (USC), 1996-1997. Research Fellow, University of Bergen, 1995-current. ConocoPhilips Communication Award (Norway) 2007. Editor's Choice 1999 by the Discrete Mathematics (Elsevier). International Journal of Computer Science & Applications (IJCSA) , since 2008.
International Journal of Smart Home (IJSH), since 2007.
International Journal of Mobile Communications (IJMC), 2003 - 2006. CloudCom 2009 - the 1st International Conference on Cloud Computing, Beijing, December 1-4, 2009. CSA 2009 - the 2nd International Conference on Computer Science and its Applications, Jeju, South Korea, December 10-12, 2009. * Program chair, Canada, 2007. * Award chair, Hong Kong, 2007. * General chair, Norway, 2008. * Award chair, Australia, 2009. Founder & Steering chair: the Cloud Computing Association (CloudCom) and its associated conference and workshop series, since 2008.
International Conference on Communications and Electronics (ICCE), Vietnam, since 2010. Teacher, Municipality of Bergen, 1989-1995.